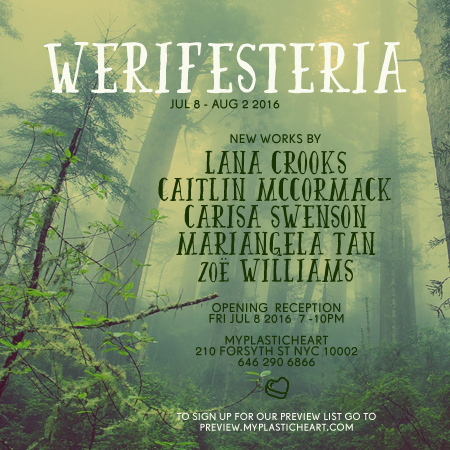 myplasticheart presents Werifesteria, an exhibition featuring the work of 5 talented artists whose main medium is in the fiber arts. Revolving around the theme of woodland folklore, and much like the mystery that surrounds the origin of the word, Werifesteria takes us on a journey in search of all the mystical and magical things we might find if we were brave enough to venture. Through the mist and into the forest, come along and explore this wondrous world. Curated by Lana Crooks. Join us on Friday July 8th from 7-10pm for the opening reception. Many of the artists will be in attendance and refreshments will be served. Exhibition runs through August 2nd 2016. The act of stiffening intricately crocheted cotton string with glue produces material that is structurally similar to delicate bone tissue. The string utilized in this process can be viewed as the basic cellular unit of fabrication, and by implementing media and practices inherited from my relatives, both living and deceased, I aim to generate emblems of my diminishing bloodline, embodied by each organism’s skeletal remains. The material out of which my work is composed acts as an alchemical conduit between the garment and the clothesline; it acknowledges the latter as a symbol of the ancestry and familiar bonds which have greatly informed my work. I wish to give the impression that a garment has disintegrated and reformed itself in the image of a tenacious animal’s remains, representative of both the persistence of memory and the significance of cloth and thread in the realm of human experience. Carisa Swenson sculpts and stitches curiously uncanny creatures that strike a balance between odd and endearing, fantastical and familiar, with a background in design and illustration. It wasn’t until 2006 after studying with renowned doll artist Wendy Froud that the final die was cast : art dolls would forever own her soul and trouble her nights, stirring her with a fervor that could only be quelled by sculpting her dreams into reality. Carisa’s passion for creating this eccentric menagerie of peculiar beasts springs from many sources – mythology, folk tales, the works of stop-motion masters Ray Harryhausen and the Brothers Quay: movies such as Watershed down and the puppetry of the Henson Workshop to name a few. Carisa’s work has been shown in numerous galleries within the United States as well as internationally, and seen in publications such as Art Doll Quarterly and Spectrum. Carisa rides in New York City and is a member of the Circus Posterus collective. Our senses are the triggers that release our memories. Memories are at the core of who we are and where we’ve been. The loss of this changes us. As an artist, I create in an effort to connect to distant memories by affecting more than just sight. Currently working in needlefelt, because it is a medium that can be both visually beautiful as well as tactile. I am constantly looking for, learning, and using new materials and techniques, in an effort to create art that affects all the senses. Inspired by the wonder and the oddities of nature, I use them as symbols of things lost or forgotten. Familiar and yet new, my work is the evolution of my memories. Zoë Williams creates otherworldly creatures that serve as spirit guides. Her sculptures are inspired by dreams, visions, and the collective unconscious.